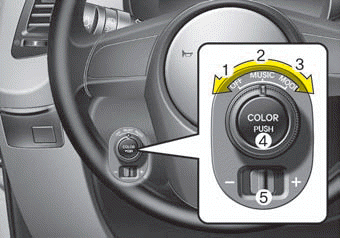 The advanced lighting speaker that lights around the front speaker is adjusted by turning the knob as follows. 1. OFF : The light turns off. 2. MUSIC : The light blinks or changes shade according to the sound of the audio. If the audio is not turned on, the light does not turn on. 3. MOOD : The light shade changes automatically at regular interval. 4. COLOR : If the button is pushed, it changes the color of speaker to red, green, blue, sky-blue, purple and yellow. 5. +/- : When the lights are on, push the illumination button to adjust the light intensity. If low lighting grade is selected, the intensity of light may be weak or may not illuminate according to the audio volume or selected condition. 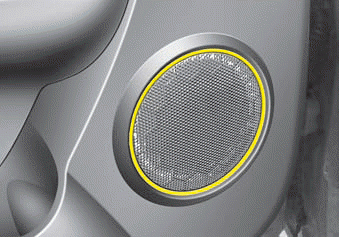 The lighting around the front speaker may not illuminate when the sound of the audio is low. Do not use the lights for extended periods when engine is not running. It may cause battery discharge. When the doors are opened, the lighting system will not operate.